Early morning hours in frozen February, the thunderous rhythms of a hovering helicopter shake our home. The sound made us believe the chopper landing pad could be our deck. Weary we woke and through the cold under the blankets, bleary-eyed, we asked why? The day and evening prior had been equally unusual between transformers that looked and popped like firecrackers on summer days and heavy laden ice limbs all around. These are more than unusual, at least for those of us who reside in South Town. The moments before we lost power, we were cuddled by the fire and snickering at flickering lights. I remember that fleeting thought, “it would be kind of fun if we lost power.” Then it was gone and we reveled in the novelty for the night. We played games, and watched a movie on the iPad in the dark. That type of novelty fades as fast as the battery. But this brutal cold morning is begun by helicopter surveying damage from fallen trees, one in particular. This oak tree must have been one hundred and fifty years old, 90 feet tall, and its fall demolished a no longer occupied homestead just around the curve of the road from our home. Local news knew it was an attention getter so the helicopter over head became just that for all of us sleeping, huddled, awaiting power. Power would not return for another day and night. Our firewood stockpile kept us going as did our warm cars and the ability to charge devices that would keep us connected. When we were able to venture out and survey the destruction first hand it was startling. We would later learn that many others saw it first for their power was working and it was, of course, on the news. Grateful no one was injured, it was sad to see such a massive tree go down and destroy anything nearby. Like any death, there is sorrow and a requisite adaptation to the new life on the other side of it, without it. Winter is not my favorite season though my northeastern husband thoroughly enjoys it and all it entails—snow shoveling, wood chopping, even driving in dangerous conditions. To me it is vast and empty and dead feeling. The world around seems to sleep the sleep of death. Of course it can be beautiful as evidenced by this ice storm. Trees sparkle in sunlight as they are armored in glass like chain mail. That is a particularly temporary beauty. Signs of life are all but obliterated as cold months pass. Yet in these long months where dark days loom large, I think of seasons of life not of the literal variety. We seem to remember them as sharply as those days we are without power because they feel like that. When we encounter a dark season, a time of struggle we feel as though we have no power. Life is hard and we long for relief, for light. I can point to several specific ones in my own lifetime. When my brother died unexpectedly in an accident, everything seemed awry. This can’t be right. Twenty nine years does not a lifetime make. Yet in that powerless moment, there was peace. Peace that came from relying on, trusting in Someone else, Someone who has power. Early marriage years, working multiple jobs trying to make payments and buy groceries seemed like they would not end. When rent is due and there isn’t enough and not for lack of trying, the end of ourselves, the feeling of powerlessness can only be surrendered. There is no other choice. And power is restored when He brings unexpected answers, aid from unexpected places. This is how He works, how we see His power most profoundly—when we have none of our own. Truly we never did, but once the illusion is destroyed we can see more clearly what has always been true. We look for and find Him in most unexpected ways. “And we know that for those who love God all things work together for good, for those who are called according to his purpose.” He is working this together. We look and wait expectantly for the Good that is coming. Good has come and we have to believe that. We are not unloved in these places. It may be momentarily hidden in our moment of nearsightedness. The pall of winter may make it seem untrue, but it is true. It is everywhere. All throughout Scripture He reminds us again and again that we are not alone, not abandoned. He is enough. 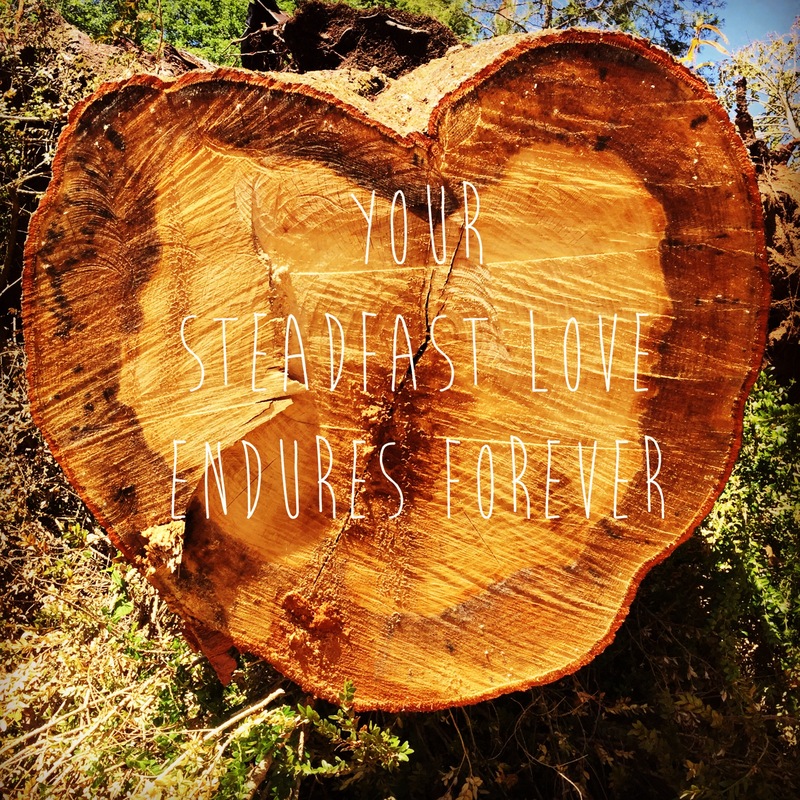 His steadfast love endures forever. When it doesn’t look like that, we trust in that. When branches are dead and pulling down power lines. When we are separated and unwillingly so. When we have done the abandoning. When we are without a job. Like the workers for the power company come in trucks and hang on poles in sub freezing temperatures, we know the work has been done for us. We don’t know how to restore power. Power was cut when communion was in the dark places of the garden. And since that moment, before that moment, Someone has been working to bring us back to the light, the warmth of communion. We needed a way to access that power. We found it, found Him, on the cross. May is nearly over and much of the mess of ice storm passed is still in need of cleanup. Crews have made their way across the county, street by street, cutting, clearing. Our bend of road is still strewn with branches brown. Spring is all around, flowers bloom and life is vibrant again. Honeysuckle vines climb on downed limbs and fences. Property owners have begun the monumental task of cutting and clearing this old tree that took power with it. Buzz of chainsaws prove that it is hard work and it takes time. They make their way day after day, section after section, removing this massive tree. As I walk each day past the spot I see the progress. This day I stop as I take in what I’d never previously seen. The upended tree has been sectioned, in huge 500 pound plus chunks. The end before me reveals the shape of the trunk—a heart. In the midst of death, the midst of destruction there is still hope. There is still life. There is still the steadfast love. It is so like God. He is using all of creation, all at His disposal to call us to Himself, to remind His own that He has plans and they are good. He reminds me again that His steadfast love endures forever.